The country stars' latest single, "Sittin' Pretty" is a laid back, stripped down song about, er, strippin' down. 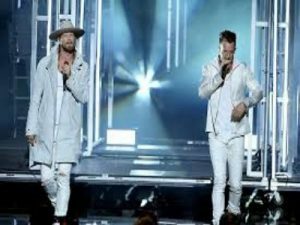 Tyler Hubbard and Brian Kelley sing about their special someone being the only thing on their to-do list before jumping into the infectious chorus. "Don't matter if we're sitting on the porch, in the car, at a bar / Or a boat down in Panama city / Gonna be a hell of a view / I'm just fine long as I'm sitting next to you sittin' pretty / I'm sitting pretty good, I'm sitting pretty," they croon during the sultry love song's chorus.